Who was E.F. Schumacher? And why should Catholics be interested in his ideas? Best-selling Catholic author Joseph Pearce explains why ‘small is still beautiful,’ and how Schumacher influenced his own conversion to Catholicism. Say the name "Joseph Pearce" and you think of the Christian literary figures he's examined in his critically-acclaimed biographies—J.R.R. Tolkien, G.K. Chesterton, Hilaire Belloc, Alexander Solzhenitsyn, and most recently, Oscar Wilde. Or you think of his signature work, Literary Converts: Spiritual Inspiration in an Age of Unbelief, an elegantly written, meta-biographical tour de force which tells the story of the Christian literary revival of the twentieth century through the lives of Evelyn Waugh, Graham Greene, Malcolm Muggeridge, and other great English-language writers who had converted to Christianity. But less well-known is Pearce's interest in economics, and his devotion to the life and thought of E.F. Schumacher, chronicled in Literary Converts (see Godspy's companion feature to this interview, The Education of E.F. Schumacher, an excerpt from Literary Converts). 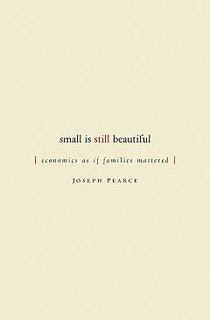 In 2001, Pearce co-wrote Small is Still Beautiful with Barbara Wood, Schumacher's daughter (The U.S. edition will be published next year). When I was in college—and an ardent democratic socialist— back in the late 1970s, interest in Schumacher was at its peak. In 1973, Schumacher had published his ground-breaking, worldwide best-selling Small is Beautiful. For the first-time, millions of countercultural, natural-living, Mother Earth News-types who had sprung up in the sixties, in rebellion against industrial society, had a manifesto of their own. Small is Beautiful connected the tools and practices found in guides such as the Whole Earth Catalog to a coherent philosophy, explaining man's proper relation to the environment, technology, business, and society. 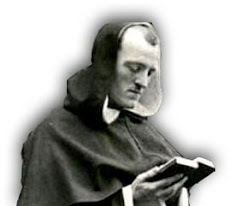 What was lost in the inevitable hype, though, was the role Catholic theology and philosophy played in Schumacher's thinking, and his conversion to the Catholic faith two years before, in 1971. Also muted was Small is Beautiful's religious critique of modernity and secularism, a critique that became more explicit in A Guide for the Perplexed, a book he finished just before he died in 1977. All this certainly surprised me when, twenty years later, and now a Catholic, I learned about Schumacher's faith via Literary Converts. I recently spoke to Joseph Pearce about this unknown E.F. Schumacher, how Schumacher's ideas influenced his own conversion, and the challenge of making Schumacher better known to Catholics, and making his religious ideas known to followers of the Green Party. GODSPY: I recently read about your dramatic conversion story, and how as a young teen in East London your anger at economic inquality, and the failed ideologies of global capitalism and neo-marxism, helped drive you towards extremist neo-fascism. It brought home for me how close to your heart Schumacher and his ideas must be. Can you comment on this? 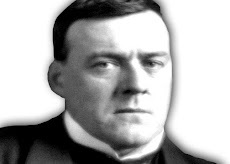 Joseph Pearce: Yes, my beliefs are solidly with the Catholic 'Third Way,' and the tradition of Schumacher and G.K. Chesterton and Hilaire Belloc and Catholic social teaching, a third way between Marxism and Mammon. The Trotskyites, the Socialist Workers Party, they would accuse us of being stormtroopers for capitalism and that sort of set me thinking... I might be opposed to communism but that doesn’t mean I want a McDonalds on every corner. However, I want to make clear that I didn't embrace extremist neo-fascism for economic reasons; it was about race and racism. I don't want to glamorize that, but neither do I want to go into some form of denial. What happened was that I was very opposed to communism. I hadn't really given the issue of capitalism or hedonism too much thought. I was fifteen when I got involved in these things. I was a teenager, but what started to happen was that the extreme left—the Trotskyites, the Socialist Workers Party—they would accuse us of being stormtroopers for capitalism. That sort of set me thinking, because I thought: "I might be opposed to communism but that doesn't mean I want a McDonalds on every corner, that multinational corporations are the way forward." I was inarticulate, but I refused to believe what the Marxists would have us believe, that it was a straightforward dichotomy between them and the capitalists. Then someone mentioned to me, "Do you know the distributist ideas of Chesterton and Belloc?" 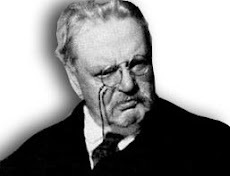 So that's how I was drawn to Chesterton and then Belloc and to distributist ideas, which really was a manifestation in early twentieth century England of what the Church now calls "subsidiarity," the principle that a central authority should perform only those tasks which cannot be performed at a more local level. Was this before your conversion to Catholicism? When you discovered Schumacher at that time, did you know he had converted to Catholicism? No, it was considerably later that I became aware of Schumacher's Catholicism. How do you explain the Schumacher phenomenon, the tremendous reaction to Small is Beautiful when it came out in 1973? Schumacher understood both capitalism and Marxism intimately, but then rejected both. I find it very encouraging that one man had such a dramatic impact on the global outlook on economic and ecological issues, that one book could become an international bestseller to such a degree that presidents of the United States wanted to be photographed with him, to show how they were enlightened. It shows what each of us can do to change public perceptions. What Schumacher was doing... first of all he was ideally qualified because he was an economist of international repute, one of the leading economists in the U.K. and he had come from a Marxist position, so he understood both capitalism and Marxism intimately, but then rejected both. Being an economist and being skilled in the tools of economics, he could show how human scale economics, economics as if people mattered, as he subtitled his work, was not only some sort of romantic desire, but a practical and applicable possibility, and that we could live ecologically and humanly responsible and dignified lives, and that we were not slaves to blind market forces or to economics of scale. Schumacher taught that economics is a derivative of philosophy, and that if you change the underlying philosophy you change the economics. What's needed in that sense is to convince people that mammon is self-destructive, both to the soul and well-being of the individual, and is destructive to the wider environment. It sounds very similar to what Pope John Paul II wrote in his encyclical Centisimus Annus, when he said his criticisms of capitalism "are directed not so much against an economic system as against an ethical and cultural system" that "reduces man to the sphere of economics and the satisfaction of material needs." People on both the left and the right have a hard time understanding that it's not just about economic systems. Yes, they don't take into account that economics is a servant not a master. Now, in terms of Marxism, things have not evolved as Marx predicted they would, so that kind of economic determinism has lost all credibility, except for a crackpot few. But with economic libertarianism, the issue there is we need to examine their assumptions: First, the free market doesn't really exist, for a number of reasons. People are always interfering with the market, advertising distorts the market, the size of economic activity distorts the market, government policy distorts the market, government subsidy distorts the market, free trade, protectionism distorts the market; the free market as a theory is actually a fallacy in the sense that there are market forces but they're never free, they're always being manipulated by somebody, whether its government or big business, so the issue is how do we interfere with the market, what actually do we want the market to be doing, how should it be manipulated for the common good. I know that libertarians, when they hear the phrase 'the common good', they think you're a communist. But of course, the whole Catholic concept of subsidarity is that both economic and politics should be done on a human scale; it's not only about small businesses but also about small government, that we want the de-volution of power away from big central government back to regional government; we want laws that do not encroach upon the rights of the family, so this is very, very different than a state-run society. Yes, for the dignity of the human person. It's about recognizing that the human person has dignity and that economics and politics should serve that dignity and the person should not be subjected to forces which are contrary to human dignity. How would you describe Schumacher's legacy—is his influence deep, or is he more of a token figure for the counterculture, the Greens? The free market as a theory is actually a fallacy in the sense that there are market forces but they’re never free, they’re always being manipulated by somebody. First, his impact was phenomenal, but it was thirty years ago. It's like a pebble thrown into a lake, where the waves ripple outward from the center, and the center gets relatively smaller. I think what happened is that the culture changed in the seventies as a result of Schumacher's book, and the emphasis on ecology now is largely due to the impact of Schumacher and Small is Beautiful. In regard to Schumacher himself, he considered his other great book, A Guide for the Perplexed, the greater of the two. He wrote Small is Beautiful first because he realized that had far greater sales potential and that its success would lead people to read A Guide for the Perplexed. Certainly, Schumacher understood that economic practice was informed by religious ideas and philosophical presuppositions, and I think that people who still know Schumacher fully realize that. About the Greens, beyond their Marxism, they've also become even more obsessed by sexual politics, by radical personal liberation, don't you think? Exactly. In many respects it's very hedonistic, and of course hedonism works against both environmental health, and individual health. You can't have a system based on selfishness in moral issues and expect, at the same time, to have an economic system based on self-restraint. It's a contradiction. On the one hand, they want complete self-centered liberation from all ethical constraint, and on the other hand, they expect people to behave economically and socially with self-restraint, and that doesn't compute. Quite frankly I think in the nineteenth and early twentieth century many people who were Marxists were responding to genuine economic injustices; however wrong their solutions were, they may have been well-intentioned. But a large part of the underlying philosophy of the Marxist or Green left today is based upon hatred of the whole of western civilization, driven by the desire to be iconoclastic against anything they consider to be traditional. Of course the result is that it leads to the breakdown of self-control, and people become hedonistic, which doesn't just mean having many sexual partners, but means having a disposal mentality in everything else, so that people like this live a very unhealthy lifestyle from the point of view of the environment, and from the point of view of their own sexual health, the sexual health of others, and social cohesion in general. That brings us to Schumacher's embrace of Humanae Vitae, Pope Paul VI's encyclical affirming the Church's teaching on marriage and sexuality, and against contraception. That must come as a shock to most people on the left. Sure. I'm not an expert on Buddhism, but I know that people who are opposed to treading on an ant—what do you think genuine Buddhists think about killing a baby? Yes, it's quite clear from everything he said that he believed that nature was intrinsically good, because it's creation, it comes from the creator. To be manipulating the fundamental building blocks of life, to be playing the role of God, is tantamount to Adam and Eve eating the apple. We do need to evangelize the Greens, and make them realize the fundamental flaw in the way they rationalize the relationship between man and the environment. At the very least, the best of the neo-pagans, the ones who are genuinely thinking about this rather than having a knee-jerk reaction against Christianity or western culture, they have some understanding of this, they believe that if you actually live in harmony with the natural way of doing things you're going to be happier. They're very into health food, they're into alternative forms of medicine, homeopathy—much of which I have a great deal of sympathy with. Natural Family Planning, and treating our bodies as natural, harmonious things that are designed to do what they're designed to do, fits in with this, with going back to the natural and escaping from the artificial. So how can someone who's against pharmaceutical products consider taking the Pill? If they can't see the disconnect, then there's a willful blindness there. It seems to me a lot of Greens believe in the perversity of "Save the Whale, Kill the Baby." You know, there's a kernel of truth there. You can't on the one hand believe in going back to the natural and, on the other hand, believe in wrenching live babies from wombs or taking drugs to make natural conception impossible. To divorce the act of sexual union from the act of fertility, the source of life, is very far from being Green, in the sense of protecting life. It's actually a culture of death. Is there any institutional interest in Schumacher that you know of—conferences, studies—on the part of the Church? I'm not aware of any. Someone once said of Catholic social teaching that it's the Church's best kept secret, and one of the reasons for that is there are some people in the Church who think it's best to keep it secret. The point is that I think there's a lot of work to be done. The whole idea of my book Small is Still Beautiful, published in the U.K., was to try to get the Greens to convert to Catholicism—with probably very little success. In the U.S. edition, which will be published next year, I'm probably going to change the tactic to try to convert American Conservatives towards the environmental approach. I make no secret at all of my position on this, in fact it's implicit in all my other books. It permeates all of Literary Converts, how these great catholic writers approach the political and social and economic problems of their age, and it's quite clear that they have a third way position. So my position is clear. The reason I haven't written more on political and economic issues is that it's not my sphere of expertise. Conservatives need to understand that everything they really hold dear ethically, religiously, culturally, is being undermined by the economics they espouse. I think there are two fronts here that are needed. We do need to evangelize the Greens, and make them realize the fundamental flaw in the way they rationalize the relationship between man and the environment. But we also need to evangelize the conservatives. Slavish adherence to so-called free market economics is actually anathema to conservatism. Chesterton said that if you want to preserve a gatepost you don't leave it as it is. You have to continually paint it. The whole idea that if you have a libertarian approach to economics you're going to preserve tradition or institutions is absurd. For instance, the homosexual lifestyle is perfect for hedonistic economics. They don't have families, prudence is not central to the way that they make consumer decisions, they're far better consumers in a free market economy than families. They have more disposable income; it makes sense for a free market economy to embrace alternative lifestyles, so really these conservatives need to understand that everything they really hold dear ethically, religiously, culturally, is being undermined by the economics they espouse, so this is something we need to make known to people. When you came to the U.S., were you surprised by the extent to which conservatives here embrace radical free market ideas? Certainly this sort of extremist, fundamentalist free market perspective is peculiar to the United States; it's not taken seriously anywhere else. I think there is something about America that is very endearing and very infuriating at the same time. It's like the world's biggest village; in some respects the naivete and the innocence is very endearing. There's a purity that comes from that as well. But on the other hand there's an ignorance that goes with that, particularly of what's happening in the rest of the world, a lack of engagement with issues that are under discussion elsewhere. What's your feeling about President Bush and the Republicans? I support them, but purely on the life issues. I think it's important that Catholics are united on those issues. But beyond that, there are many things on the Republican agenda that I find troubling, and not just in the Schwarzenneger wing, which is very suspect on life issues. President Bush is good on life issues, but on many other matters, I can't give my support. ANGELO MATERA is editor and publisher of Godspy. This interview was originally published in the online Catholic magazine, GodSpy.com. Reprinted with permission. ©GodSpy.com, All Rights Reserved.